Thailand is planning major expansion of its MRO sector, which should enable the country’s maintenance providers to compete for more regional business. Thailand currently has relatively limited MRO capacity, making it difficult to handle its own fast growing fleet. The Thailand government is heavily promoting and investing in a new maintenance complex at U-Tapao Airport outside Bangkok. Thai Airways’ maintenance division, Thai Technical, is planning to open a new joint venture widebody airframe maintenance facility at U-Tapao with Airbus and could forge partnerships with other manufacturers. The largest LCC group in Thailand, AirAsia, is also aiming to establishing a MRO complex at U-Tapao. Thai Technical’s main facility is now at Bangkok’s old airport Don Mueang, while Thai AirAsia outsources its maintenance. Bangkok Airways and several independent MRO providers also have facilities at Don Mueang, where there is limited, or no, space for expansion. Thailand is developing U-Tapao Airport outside Bangkok into a maintenance hub with new joint venture facilities from Thai Airways and potentially AirAsia. Bangkok Airways is also planning MRO expansion with a new facility at Sukhothai and a new third-party business. Heavy maintenance on Thai Airways, Bangkok Airways and Thai AirAsia aircraft is now done at Bangkok Don Mueang, but space constraints at Don Mueang preclude MRO expansion. Bangkok Suvarnabhumi has an A380 hangar for Thai Airways but has relatively limited MRO capabilities and is unlikely to expand as the focus shifts to U-Tapao. Thai Airways’ main maintenance base has been at Don Mueang for nearly 50 years. Thai Airways moved its hub from Don Mueang to Suvarnabhumi as Suvarnabhumi opened in 2006 but never invested in building up a heavy maintenance capability at Suvarnabhumi except for the A380, which cannot be accommodated at any of the Don Mueang hangars. U-Tapao Airport is now poised to become Thai’s main maintenance base, taking over the A380 from Suvarnabhumi and potentially some of the aircraft types now maintained at Don Mueang. U-Tapao has ample space and support from the government, which plans to make the area around U-Tapao a new economic corridor. U-Tapao is a Royal Thai Navy-owned airport 200km from Bangkok. Thai Airways is leasing land from the Royal Thai Navy to build the new MRO centre at U-Tapao. There is virtually no space at Don Mueang to accommodate MRO expansion. Don Mueang has become an LCC hub and this year will accommodate more passengers than it did before the opening of Suvarnabhumi. Thai’s current MRO facility at Don Mueang is now surrounded by active aircraft stands, with passengers being bused to the ageing terminals. It is not an ideal situation for flight operations and Don Mueang is now prone to frequent delays. Thai Technical has significant heavy airframe maintenance capability at Don Mueang and says it currently performs C and D checks on 737s, 747s, 777s, A320s and A330s. The group has all these aircraft types in its current fleet except for 737s, which were phased out earlier this month, and also does some work on these types for third-party customers. Note: The A320 fleet is operated by full service regional subsidiary Thai Smile. Thai Airways told CAPA earlier this year that it was planning to add 787 heavy maintenance capability at Don Mueang in 2018. Thai Airways began operating 787s in 2H2014. The airline says it also plans to add A350 heavy maintenance capability at Don Mueang in 2019. Thai Airways began operating A350s in 2H2016. Thai Technical’s Don Mueang facility also includes overhaul shops for several types of components and engines. Components cover the 737, 747, 777, A320 and A330. A wheels and brakes shop is being opened this year. Engine types being handed at Thai’s Don Mueang facility include the CFM56, V2500, PW4100, Trent 700, and GE CF6. Thai Airways plans to add capability for the Trent XWB, which power its new A350 fleet. For all airframe and engine capabilities, Thai Airways has certification from the Civil Aviation Authority of Thailand (CAAT), as well as certification from the FAA or EASA. FAA and EASA certification helps Thai Technical to secure work from other airlines and leasing companies, but historically the facility has not had much spare capacity to accommodate third-party business. Thai has continued to do all heavy maintenance at Don Mueang since Suvarnabhumi opened, except for A380s. Thai Airways took delivery of its six A380s in 2012 and 2013. The airline says it has so far completed C1 and C2 level heavy checks on A380s using its hangar at Suvarnabhumi. Thai Technical’s Suvarnabhumi facility is also used for light maintenance (A checks) and line maintenance for all aircraft types operated by Thai Airways and Thai Smile. Thai Technical also does light and line maintenance for third-party customers at both Suvarnabhumi and Don Mueang. It is also currently performing line maintenance at U-Tapao for Qatar Airways, which began serving U-Tapao in 2016. Thai Airways plans to begin perform A380 C3 level checks this year at the U-Tapao facility. It says U-Tapao is also now certified or is in the process of being certified for the A330, 737, 747-400 and 777. Over the next several years U-Tapao will become a major MRO centre, with capacity to handle both Thai Airways and a much larger third-party business. Airbus and Thai Airways completed an agreement in Jun-2018 to establish a new JV MRO facility at U-Tapao. The new JV, which was initially agreed in 2017, will cover all Airbus widebody types. Airbus has stated that the new MRO complex will also have specialised repair shops, including for composite structures, as well as a maintenance training centre offering extensive courses for technical personnel from Thailand and overseas. In Jun-2018 the final agreement with Airbus was signed in Toulouse in the presence of the Prime Minister of Thailand Prayut Chan-o-cha. The high level signing is an indication of the high priority Thailand has placed on building up its MRO capability. As CAPA highlighted in an earlier analysis report, Thailand is converting U-Tapao into a third major airport for the Bangkok area, with capacity for up to 60 million passengers per year. A high speed rail link is planned to connect U-Tapao Airport with Bangkok – which should help attract traffic as well as investment. The government has been very active in promoting U-Tapao as a potential MRO and aerospace hub. The government views the development of U-Tapao to be a major airport and MRO facility as a key economic growth driver for eastern Thailand. Thai Airways could potentially establish other MRO joint venture shops at U-Tapao. The government has had high level talks with several countries and manufacturers in an attempt to secure more MRO sector investment. Other airlines and independent MRO providers could also be attracted to U-Tapao, particularly if government incentives are offered. Of the other major airlines in Thailand, only Bangkok Airways currently has its own heavy maintenance capability. Other airlines in Thailand generally outsource their maintenance, but some could be swayed to use local companies as capabilities in Thailand expand. For example, Nok Air uses Lufthansa Technik to maintain its 737 fleet, according to the CAPA MRO Matrix, but Lufthansa Technik does not have any facilities in Thailand. Nok Air is expected to continue to outsource their maintenance but could potentially use providers that set up at U-Tapao as U-Tapao grows. Thailand’s largest LCC, Thai AirAsia, use Thai Aviation Industries (TAI) to maintain its A320 fleet, according to the CAPA MRO Matrix. TAI is an independent provider which has a facility at Don Mueang. AirAsia Group founder and CEO Tony Fernandes stated in May-2018 that the group was planning to invest USD150 million to establish an MRO facility at U-Tapao. It is not yet clear if AirAsia will partner with an MRO firm or manufacturer or pursue the project on its own, which would be an unusual move for an LCC. As the Airbus JV with Thai Technic is focused on widebody aircraft, a separate JV facility could potentially be established to focus on A320 narrowbody aircraft. Thai AirAsia operates an all-A320 fleet, although its sister airline Thai AirAsia X operates A330 widebody aircraft, a type covered in the Thai Technic JV facility. The proposed AirAsia MRO complex at U-Tapao could also potentially maintain A320s operated by other AirAsia Group airlines outside Thailand, as well as for third-party customers. Thailand’s third main LCC, Thai Lion Air, tells CAPA it uses Lion Group's sister company Batam Aero Technics (BAT) in Indonesia to maintain its fleet of 737s and A330s. Thai Lion performs its own light checks at Don Mueang but does not plan to build up its own heavy MRO capability. Bangkok Airways, the second largest full service airline in Thailand, tells CAPA it has no intention of establishing a facility at U-Tapao. Instead, it plans to build new maintenance facilities at Sukhothai in central Thailand and potentially at Suvarnabhumi. Bangkok Airways plans to begin constructing an MRO centre at Sukhothai by the end of 2018 and to open the facility in 2020. Bangkok Airways currently has a one bay hangar at Don Mueang and has been unable to expand the facility, forcing it to outsource some of its maintenance. Bangkok Airways plans to build a two bay facility at Sukhothai, where it owns and manages an airport. Sukhothai Airport currently only has two daily ATR 72 flights (from Bangkok). However, there is ample space for maintenance and Bangkok Airways intends to use the new MRO centre at Sukhothai for both ATR 72s and A320s. Bangkok Airways tells CAPA it plans to secure EASA certification once the Sukhothai facility is opened, enabling it to pursue third-party business. Bangkok Airways does not currently do any third-party work but is keen to develop a third-party business once it has the capacity. Once Sukhothai is open it will have the capacity to overhaul three aircraft at once, compared to one aircraft currently. Bangkok Airways operates a fleet of 39 aircraft. There are currently 319 aircraft operating in Thailand, according to the CAPA Fleet Database. The fleet has grown by over 50% over the past five years, from 218 aircraft in Sep-2013. 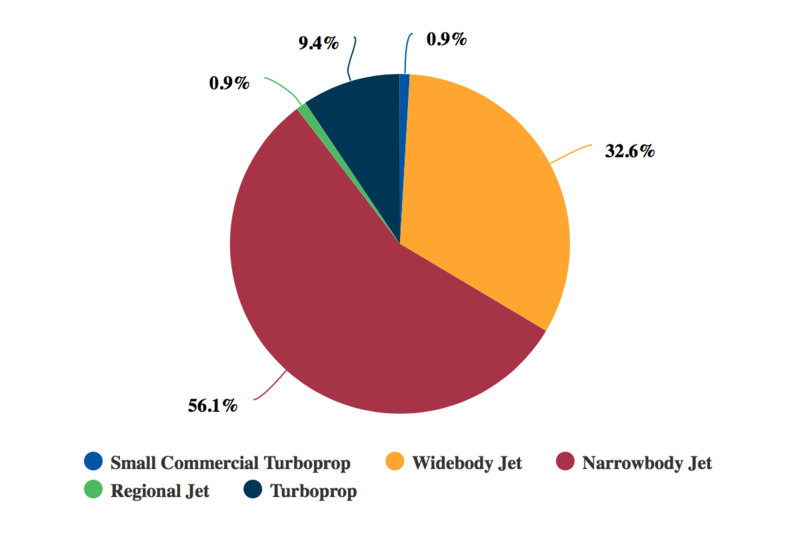 More than half of the fleet now consists of narrowbody jet aircraft. 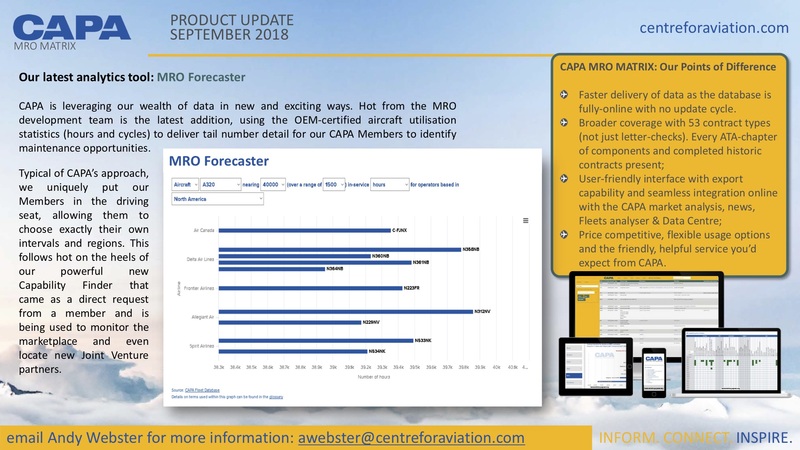 Thailand’s fleet is expected to continue growing rapidly over the next several years and more MRO capacity should help Thailand keep up with its own fleet growth. Thailand also aims to benefit from the rapid fleet growth expected in the wider region. In their JV announcement, Thai Airways and Airbus pointed out that the Asian widebody fleet is expected to triple in size over the next 20 years. However, securing third-party customers could be challenging, given the intensely competitive nature of the MRO sector. 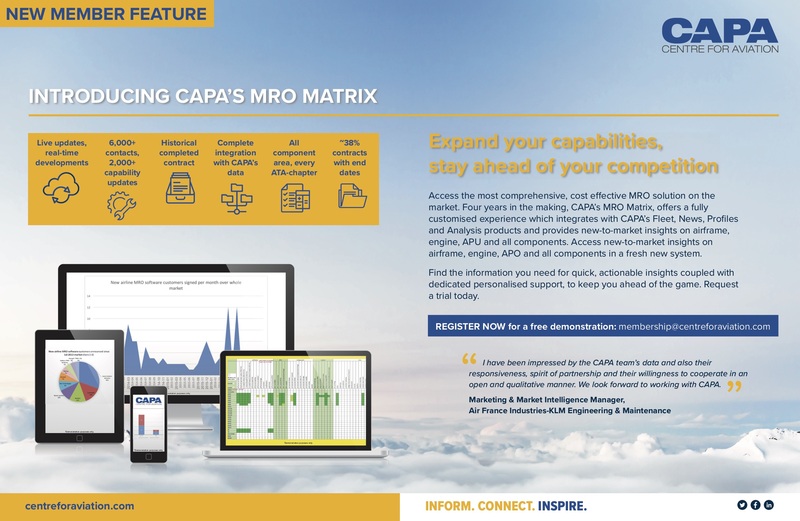 There are several major, and more established, MRO players in Asia. Time will tell if Thailand’s ambitious MRO strategy will pay off.